Is procrastinating costing you business? On Friday I challenged attendees at a networking group to identify the biggest obstacle to progress in developing their businesses, I wasn’t really surprised that procrastination ranked highly. My dictionary defines to procrastinate as ‘to put off (an action) until later, delay’ from the Latin procrastinare ‘to postpone until tomorrow’. Tomorrow never comes so sometimes we never do the things that we need to do for our businesses to thrive! What do we have to gain from procrastination? We might tell ourselves that procrastinating will lead to better decisions, that we work better under pressure and that ideas will come if we give them time. Aren’t we just kidding ourselves? True, from time to time inspiration may strike when we’ve given it time or something we’ve been putting off may no longer be necessary but most of the time we will have wasted time or opportunities. What do we have to lose from procrastination? Procrastination leads to lost opportunities and increased stress. Tasks take on increased proportions the longer we put them off. We can lose sleep worrying about what we haven’t done and our relationships with our customers, colleagues and nearest and dearest can be adversely affected. 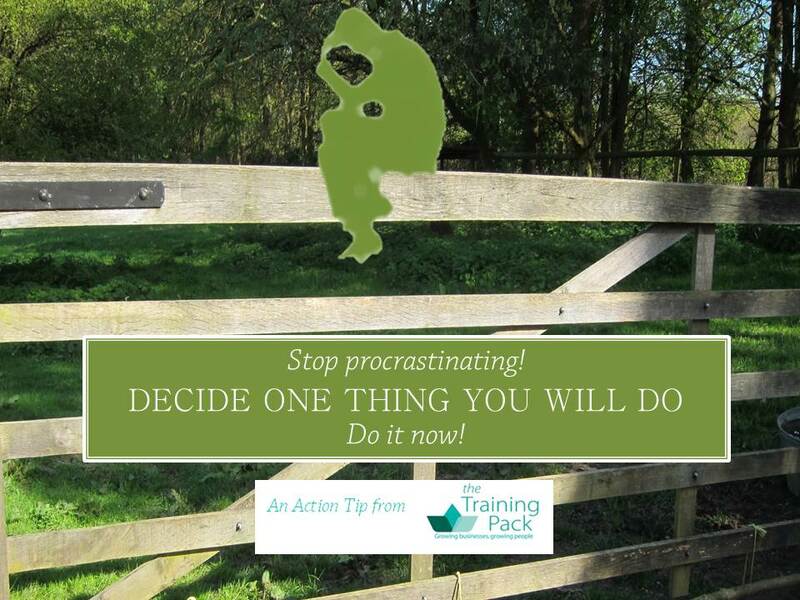 Procrastination can cost us business so how we can avoid it? So how can we avoid procrastinating? “Telling someone who procrastinates to buy a weekly planner is like telling someone with chronic depression to just cheer up,” Dr. Joesph Ferrari. rewarding myself at pre-determined points for example 20 minutes reading when I’ve done an hour on the task, a glass of wine when it is complete! So if this article has resonated with you because of that task you’ve been putting off let me challenge you to take some action now. Pick up that phone, get on that computer, put away that biscuit, find your trainers, make that decision! No excuses! I know that today is a Bank Holiday here in the UK and that the kids are off for half term so if you genuinely can’t take action today make a commitment to taking it on your next working day. Write it in your diary. Pin a post it note to the fridge, the computer and the front door. Make a commitment here. I know that whenever I take the action I’ve been putting off the relief is palpable. The task was never as big or as onerous as I thought and the sense of achievement when it’s done is well worth celebrating. I’m off to to tidy my office and then to do some administration. I’m taking my own advice today! Good luck with doing that task that you’ve been putting off but if you need some help why not book a free 30 minute telephone consultation and let’s unblock those obstacles. Book here. This entry was posted in Business development, Small business advice, Time management and tagged getting things done, procrastination, productivity, taking action by glendashawley. Bookmark the permalink.